I am using Azure Cosmos DB as my xDB, I am currently at test phase and have very few data and requests made by my app. I know this is not a fully supported platform, still I find it very useful and easy to use. I am very surprised to see that, even when there is no visit on the cd website, during the night (which is not in production, so there was absolutely no one), there are 2k queries, updates and 6k other requests. Is that normal behaviour ? 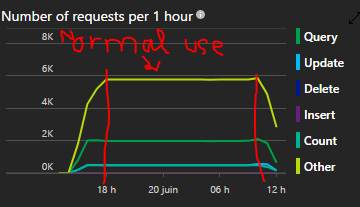 Is there something I can fix to lower the number of requests ? Have you looked at your aggregation services? These regularly hit the collection database and update the reporting SQL tables and the analytics index by aggregating the information in xDB. 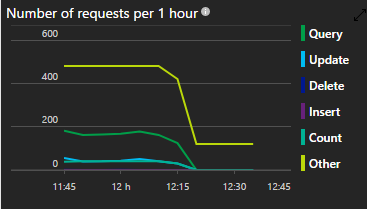 Try disabling your processing server (or processing configs if you do have a separate service running) and see if you still get all those requests.